Nike SB is know for being one of the most exclusive shoes. Come in to Pure Board Shop to pick up the new Dunk Highs and Koston's. Nike SB is a brand that has become synonymous with the Sneaker Head Culture. They release new shoes each month along with their In Store only models and their Quick Strikes. 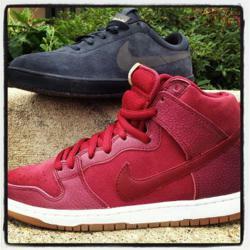 New in at Pure Board Shop are the Red Dunk High Pros and the Purple Eric Koston's. Both of these shoes are In Store only and are highly limited so get into Pure quick to grab these shoes. Pure Board Shop is always getting in new Nike SB's. In fact it is one of the only places in Maryland where Nike SB Quick Strikes can be found. So follow Pure on twitter and Facebook to find out when any new shoes are dropping.